It doesn't take much to move Calumet's stock anymore, but this month gave the company's turnaround story an extra boost courtesy of President-elect Donald Trump. 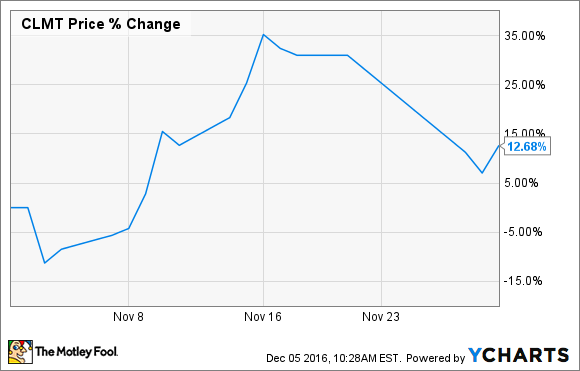 Shares of Calumet Specialty Products Partners (NASDAQ:CLMT) had a roller-coaster month, but they ended up gaining 12.7% in November. One thing to consider with any surge or slump in shares of Calumet is that the company is pretty much a penny stock. On any given day, the stock price can move double digits for no particular reason whatsoever. In November alone, we saw swings where the stock price swung as low as a 10% loss to as high as a 35% gain. So, any large movement in Calumet's stock price should be taken with a grain of salt since it may not necessarily be related to the business itself. As far as why investors were a little more bullish about the stock this past month, it has much to do with the possibility that President-elect Donald Trump will loosen some regulations related to refineries as he mentioned he would on the campaign trail. Refineries have been taking a big hit lately from the costs for complying with the U.S. EPA's renewable fuels and ethanol requirements. Calumet's fuels business has been one of its weak points in recent quarters, and the cost of compliance to these rules played a part in that weakness, but it was far from the only thing that has caused this part of the business to struggle. As much as investors want to think the removal of these ethanol requirements will ease Calumet's suffering, the truth of the matter is that the company's issues run much, much deeper. Sure, there is a stable, profitable segment somewhere in this business, but it's buried under other very cyclical, low-return operations and a seemingly insurmountable debt. If either of these things can be addressed, then perhaps Calumet is worth reconsidering, but as it is, this company's stock is var too volatile and the prospects of the business are far too suspect for any serious investors to consider it for their portfolios long term.